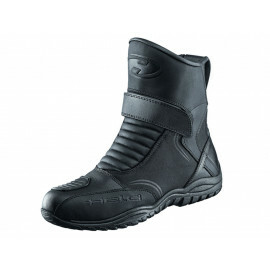 Welcome to our shop for SIDI motorcycle boots, gloves, shoes, outdoor clothing and accessories. Besides motorcycle clothing, SIDI successfully manufactures cycling shoes and other bicycle equipment. The Italian company which was founded in 1960 by Dino Signori, specializes in on and off-road motorcycle boots. SIDI boots are famous for their innovative technology, their superior comfort, durability and distinctive design. Wherever you wear them, whether riding on a super sport bike on the racetrack, on a motorcycle trip in any weather or terrain or off-road on your Enduro bike, SIDI motorcycle boots provide perfect protection and a comfortable fit. Many top riders from the Moto GP series and the motocross scene have confidence in SIDI boots. The brand’s new motorcycle boots collection can be divided into the following segments: racing boots, off-road boots, touring motorcycle boots and women's boots. The SIDI Vertigo boot is probably the most popular SIDI boot. Available in various colors and designs, the sporty and fashionable Vertigo motorcycle boot is especially known for its modern and stylish design and excellent price-performance ratio. SIDI boots can be easily recognised by their distinctive logo and brand name. SIDI motorcycle boots are available in many colours, so you can always match the shoes to the colour of your clothing and bike. Besides motorcycle boots, SIDI also sells motorcycle gloves, casual wear such as shirts, shoes, jackets and caps as well as accessories and spare parts for motorcycle boots. We at moto24 are pleased to present you the full line of SIDI boots, clothing, spare parts and accessories. If you have any questions or cannot find SIDI boots in the desired size, design or colour, contact us. Our staff will help you.